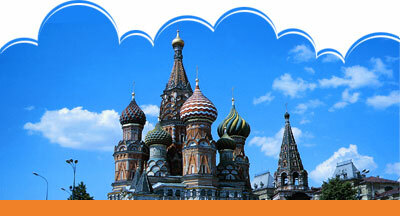 Russia is the largest country in the world in area, and it can trace its history back to the 9th century. For hundreds of years, Russia was ruled by czars who exercised almost absolute control over many aspects of Russian life. As Western nations began to industrialize during the 17th century, Russia's development lagged behind. At the turn of the 20th century, most of the russian population was still made up of poor, uneducated peasants. Opposition to the absolute power of the czar increased early in the 20th century. Revolutionaries led by Lenin and Trotsky overthrew the czarist regime in 1917 and established what came eventually to be known as the Soviet communist government. In 1922 Russia joined with three ohter republics to from the Union of Soviet Socialist Republics (USSR), also known as the Soviet Union. By 1956, the U.S.S.R. had expanded to 15 republics controlled by a centralized communist government, with Russia as the largest and most influental republic. Leaders in the Soviet Union attempted to control most aspects of the country's economy, including banking, foreign trade, heavy industry, and transportation. Under Lenin, most small business owners and small farmers retained control of their enterprises. Lenin died in 1924, and Stalin became dictator in 1929. Stalin extended the control of the government over the economy and the lives of the people. Under Stalin the government took control of prices, wages and the distribution of goods. Stalin's form of communism emphasized the development of heavy industry and set high goals for industrial production. He combined privately-owned farms into large, government-run agriculture collectives. Stalin also instituted a reign of terror called the Great Purge, in which millions of people were arrested and murdered or sent to labor camps. Stalin died in 1953. His successors, including Krushchev and Brezhnev, relaxed government controls to some extent, but they left the communist system basically intact. But in 1985 Mikhail Gorbachev became leader of the Communist Party; he introduced the reforms that finally resulted in the break-up of the Soviet Union. My Profile at informBank. Also, you can read more articles written by me here: informBank.com.